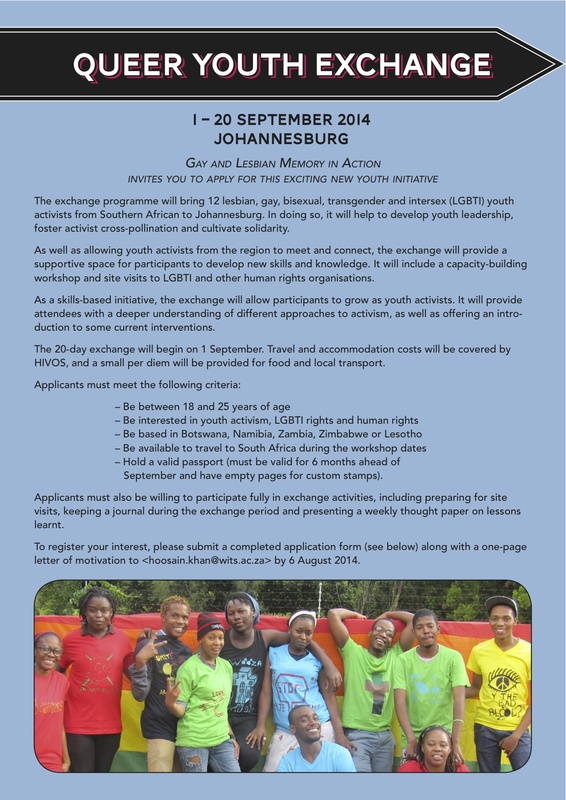 This entry was posted in Abantu, Academic, Activism, Activists, Activists Act, Africa, African, African Queer Beauty, Allies, Announcement, Another Approach Is Possible, Application forms, Archived memories, Archiving Queer Her/Histories in SA, Art Edutainment, Articles, As we are, Attention, Audience, Awareness workshops, Baring, Before You, black LGBTIQA, Bringing photography to schools, Career, Celebrating Youth Month in SA, Characters, Claiming mainstream spaces, Collaborations, Collective, Collectivism, Comment, Commitment, Committed, Communication strategies, Community Mobilizing, Community outreach, Community work, Connected souls, Connections, Consultants, Contributors, Crea(c)tive senses, Creating awareness, Creative activist, Culture of reading and writing, Delegation, Description, Details, Different positions, Discussion, Documentation; Filming; Photography; Community, Education, Emotional support, Empowerment, Evidence, Experience, Exposure, Expression, Facilitation, Facilitators, Family and Friends, Family support, Freedom of being, Friendships, Gauteng, Gay & Lesbian Memory in Action (GALA), Gender expression, Gender naming, Invitation to apply, Johannesburg, Sexuality in South Africa, Sharing, Sharing knowledge, South African Youth, Support, Supporting each other, Teaching, Visual democracy, Visual history, Visual history is a Right not a luxury, Visual narratives, Writing is a Right, Youth voices. Bookmark the permalink. Hi, where is the link for the application form?